Always ready for fun, five Chicago Partners came together at the last minute to enjoy an evening of music at Chicago’s Grant Park Musical Festival in Millennium Park on Wednesday August 7. The evening featured James Carter in a Concerto for Saxophones created for James by the Detroit Symphony. Also on the program were: Gabriel Castagna’s Milongón Festivo; Alberto Ginastera’s Pampeana No.3 Pastoral Symphony; and Heitor Villa-Lobos’s Bachianas Brasileiras No. 7. Irene, Gail, Dave and Dan are all charter members of the Chicago Partners and Mary Lou has been involved with the Passionist at Immaculate Conception Parish since 1965. Irene served as the Chicago Monastery Librarian from 1980 to its closing this past Fall. Gail’s husband Pat, also a charter member of the Chicago Partners was not able to attend. It is the terminal illness of his younger brother that brought Gail and Pat back from Oahu, Hawaii where they moved this past December, and occasioned the impromptu gathering. Prayers for Pat’s brother will be greatly appreciated. 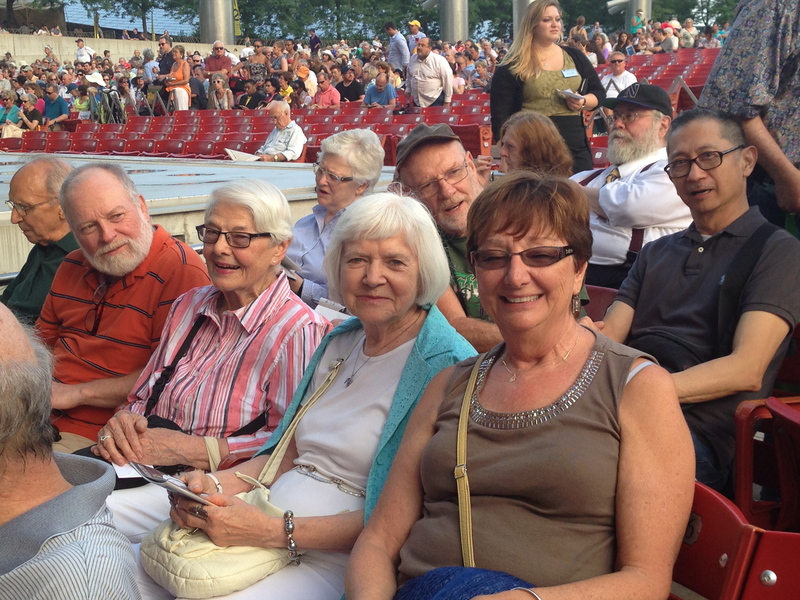 What a delightful time we had at the concert….it was a beautiful night, good company and wonderful,wonderful music.